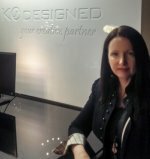 KoDesigned is a Brisbane based Interior Design company offering residential & commercial clients a range of creative and personalised interior design solutions for their projects. Planning, designing, managing & delivering practical, functional & aesthetically pleasing interiors is what we pride ourselves on providing. Our mission is to provide client focused positive interior outcomes, through high standards of business integrity and sustainability. We deliver responsible professional services that result in long-term value to our clients. We also offer an initial complementary consultation in our design studio or on site. Louise holds tertiary qualifications in Interior Design, CAD and Project Management. During her extensive interior design career Louise has enjoyed working with a number of prominent Australian Interior Design firms. Her professional experience includes clients & projects both nationally and internationally, in sophisticated markets such as the United Kingdom, France & America. Louise is passionate about creative and strategic design and has a proven track record in delivering projects that are unique and original. She also places huge emphasis on staying current with design trends and regularly attends trade fairs worldwide. KoDesigned is committed to conducting business in an environmental friendly and proactive manner. We believe it is up to us, here and now, to make a difference. We like to call it the “Bower Bird Philosophy” - Reclaim - Reuse – Reinvent. KoDesigned can assist its clients in making informed environmentally sustainable choices throughout the design & selection process, and aligns itself with companies who share and deliver these same values.